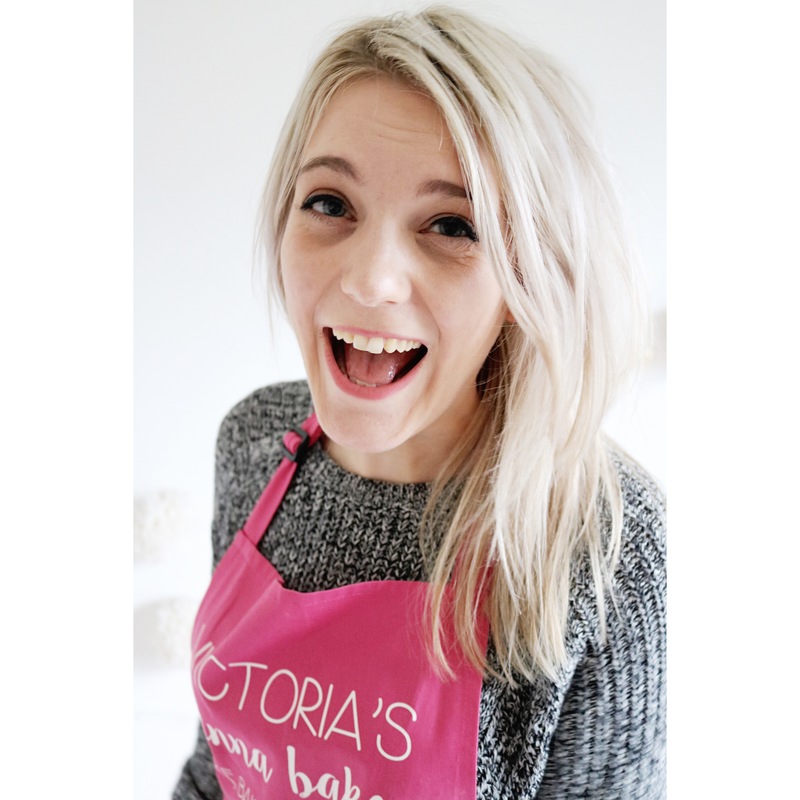 Why is it that baking feels like a process of pure alchemy at times? I often wonder, stood in my kitchen on a Saturday morning, cubing butter to ensure it softens quicker and surveying the counter full of ingredients how all of it could possibly become the finished article. It feels ever more apparent when I’m baking gluten free cakes, staring at the folded down bag of rice flour and roasted hazelnuts that replace my usual bag of self raising. How did we stumble upon this? Who was it that realised toasted nuts ground into tiny crumbs could replace wheat flour, ensuring thousands of bellies across the country could enjoy the simple pleasure of a slice of cake that so many of us who can tolerate gluten take for granted? As I research and read more about life without gluten, modifying my diet accordingly (I’ve been eating less of it of late), I feel thankful that there are people out there paving the way for diet-restricted diners to feel included. Why not let them eat cake? It’s a perfectly easy to do. 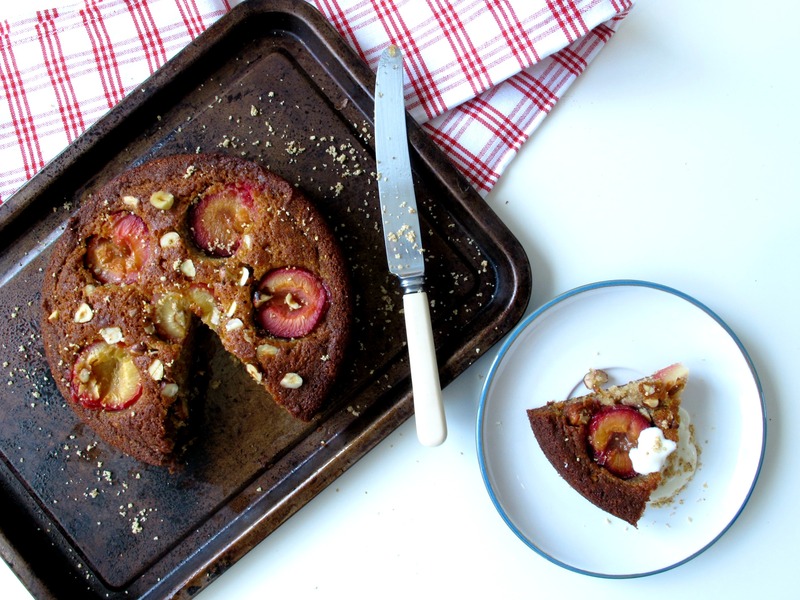 With the readiness of ground almonds, any gluten free baker’s staple ingredient, I wanted to experiment to create a comforting winter cake with something other than the obvious. Ground hazelnuts can be found in the occasional baking aisle, but since I shop in a rather small Tesco it’s actually easier for me to make my own. But then what could be better, coffee in hand, than the kitchen smelling of toasted hazelnuts on a lazy Saturday morning? I must admit, having rolled the nuts in a tea towel to remove their skins, I was tempted to keep whirring them in the food processor to a paste, adding cocoa and creating a homemade Nutella. Perhaps that’s one for another day, for these hazelnuts were destined to be folded with rice flour, softened creamy butter and mellow honey to create a thick batter to fill one of my many new cake tins received at Christmas. 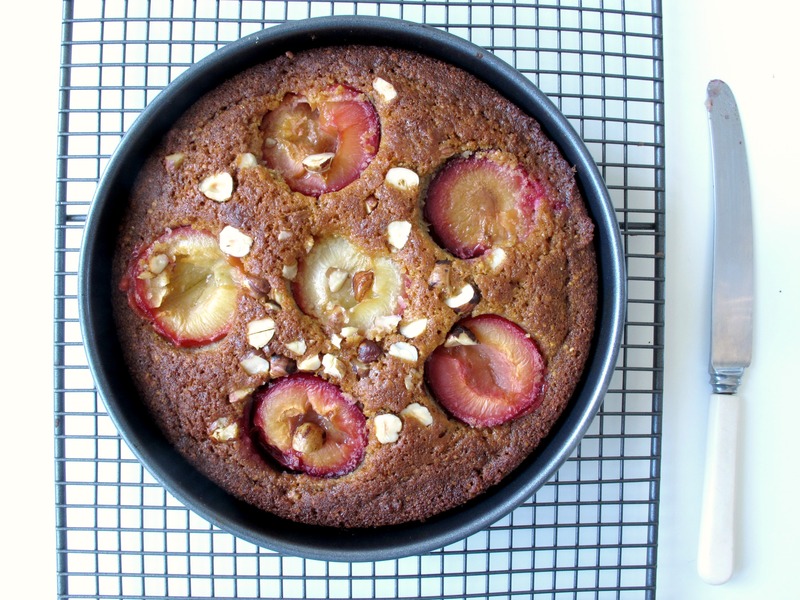 Studded with halved purple plums and scattered with the roughest of chopped hazelnuts, this gluten free beauty bakes into a soft, mealy cake puddled with jammy fruit. It keeps incredibly well, possibly even improving after a couple of days and gorgeous with a cosy cup of tea. It may be gluten free, but when it tastes this good, the chemistry that created it pales in comparison to the pure enjoyment of simply eating it. 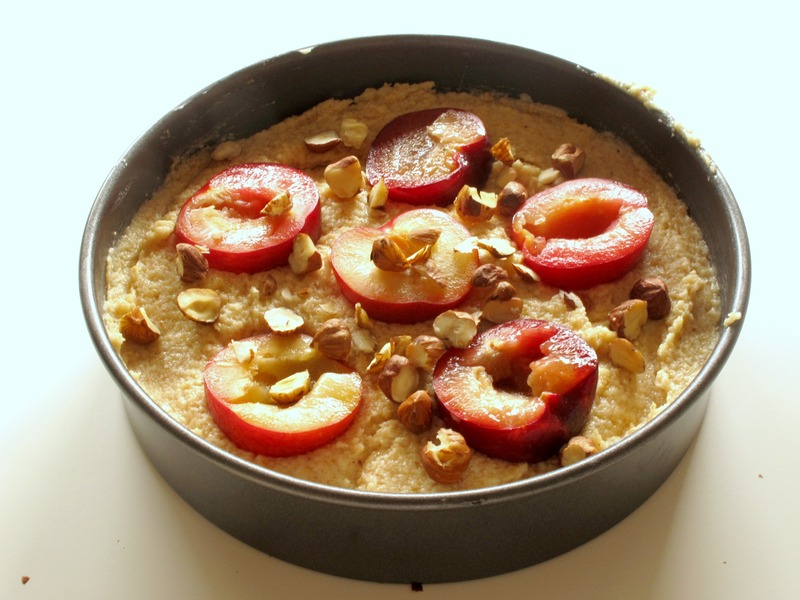 Preheat an oven to 170oc/150oc and place the hazelnuts on a baking tray. Bake for around 5-7 minutes until fragrant and toasted then remove from the oven to cool slightly. Place in a clean tea towel and rub together to remove the skins as best you can. 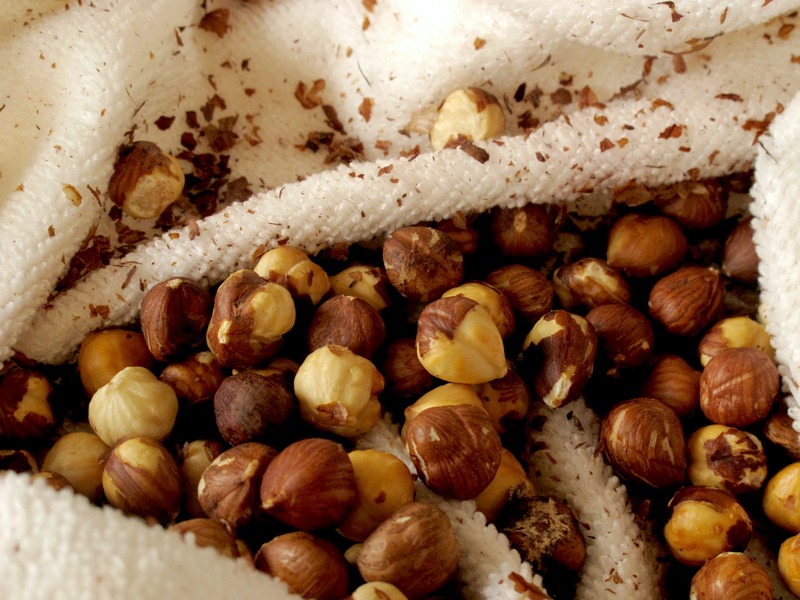 Transfer the cooled hazelnuts to a food processor and blitz to a fine meal. Reweigh the ground hazelnuts to 75g – you should have a little left over which you can sprinkle over the cake when serving. In the bowl of a stand mixer, beat the butter to a smooth consistency and add the honey and vanilla paste. Beat for around 2-3 minutes until smooth then slowly add the eggs while the mixer is running. If it starts to curdle, add a little of the rice flour but don’t worry, it should come back together with the rest of the dry ingredients. Once smooth, add the ground hazelnuts, rice flour, bicarbonate of soda and salt and beat briefly on high until the mix comes together then give it a few folds by hand to ensure it is well mixed without overbeating. Grease a 18cm round cake tin with butter and line the bottom with baking parchment before buttering the paper again. 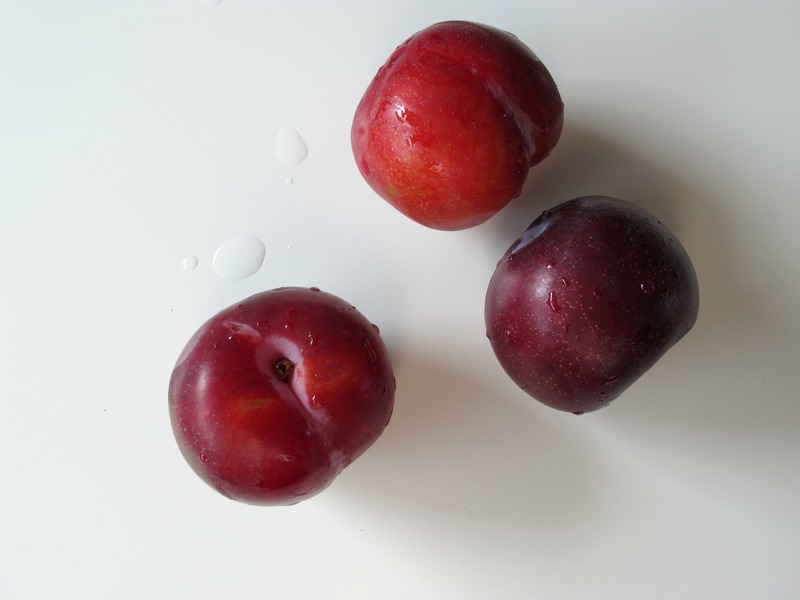 Dollop the cake mix into the tin and smooth in an even layer, then press the plum halves into the batter. Scatter with the chopped hazelnuts and place in the oven to bake for around 35 minutes until golden brown and springy to the touch. Leave to cool for 10 minutes in the tin then invert onto a cooling rack then back the right way up with a second rack. Leave to cool then serve in wedges with the reserved ground hazelnuts and a few dollops of crème fraiche if you like. 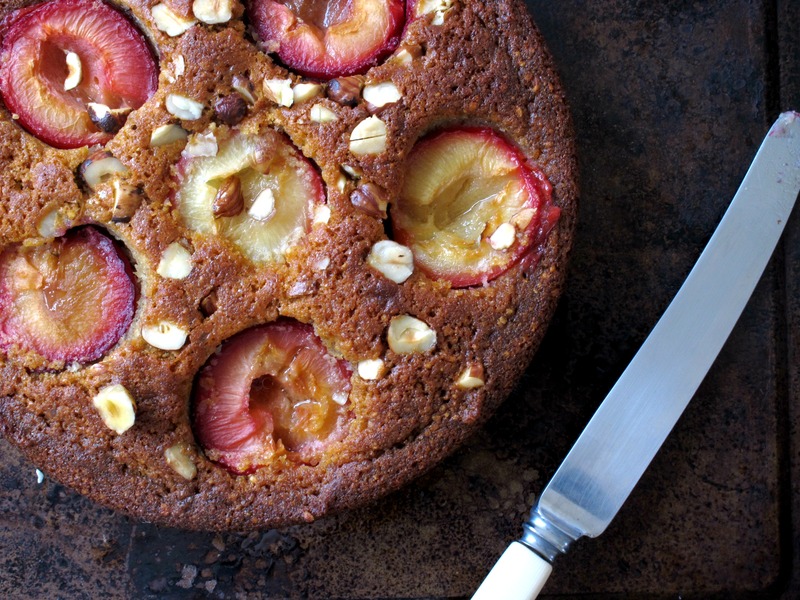 That cake looks gorgeous , but my favourite photo here has to be the hazlenuts – wonderful.